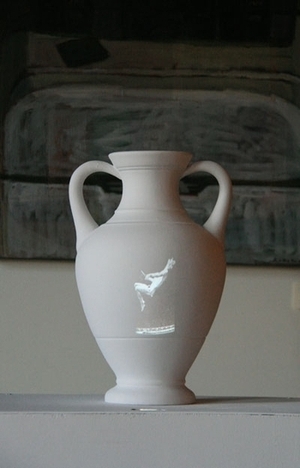 We are used to seeing the depiction of running or jumping athletes on the Greek vases. Five ancient amphorae in this installation have the same subject, except that, instead of the familiar red or black figures, we see on them videos based on Muybridge’s photographs “Human Figures in Motion” taken only about a century ago. This work of the 21st century could be called “post-post-modern” in that it proves that everything old (or very-very old) is new again.